Tiësto has announced the addition of Chicago, Illinois and several West Coast dates to his “Club Life College Invasion Tour.” Special guests will accompany Tiësto on all dates - Dada Life will perform at the Chicago date while Tommy Trash will perform at all West Coast dates. The tour was the first and is the largest dance music tour to ever hit the American college market and features special guests Dada Life, Bingo Players and Tommy Trash. Tiësto will headline the tour this fall/autumn with stops at campuses across the United States. 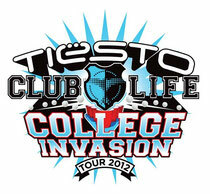 Launched in 2011, Tiësto's “Club Life College Invasion Tour” visited 18 college markets across the USA and Canada. It was a phenomenal success and opened the door for college-focused tours from other big name DJs. It culminated with Tiësto’s sold-out record breaking performance at the 26,000 seat Home Depot Center in Los Angeles.